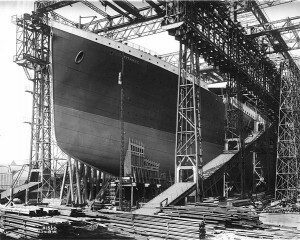 Arabianbusiness.com is reporting that Titanic II will be launched in late 2018 according to a Palmer spokesman. 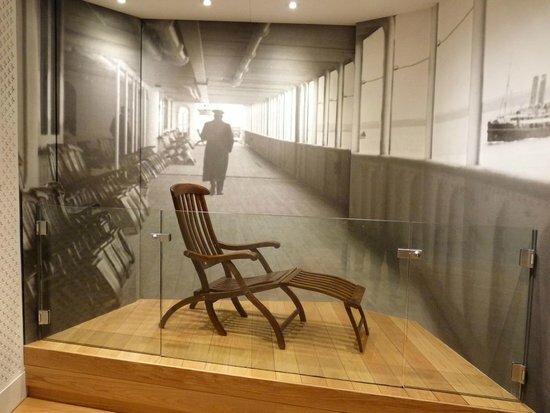 The article points out that back in 2013 Palmer and Blue Star Line were involved in discussions with companies in the United Arab Emirates about Titanic II which included coming to Dubai for its maiden voyage. Could this signal perhaps a change in course (pun intended) about the ship construction? All the reporting so far is that Palmer has had real problems getting Chinese backers and his spat with the Chinese government made things look bleak. Add to it they are already building a Titanic replica for a theme park seems to go against it being built there. How about Abu Dhabi? Italian shipbuilders Fincantieri expanded their shipyard in Abu Dhabi in 2012 to build more ships for the UAE navy. It is a joint venture with Etihad Ship Building (ESB). Now the Italian shipyard is focused on building naval vessels but what if the UAE wants Titanic II built there? Stay tuned folks. Of course this could just be puffery and Palmer is known for it. Then again he might have found investors there more eager to invest in Titanic II than in China. It was just around noon on 24 August 79 AD when Mt. Vesuvius erupted with a massive 10 mile mushroom cloud sent into the stratosphere. Ash and pumice would rain down on the area for over twelve hours. People who did not flee would face something much worse when a pyroclastic flow would sweep down killing everyone in its path. The choking cloud suffocated everyone even rescuers. The Bay of Naples where Mt. 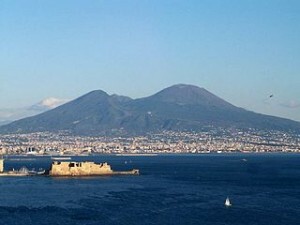 Vesuvius is located was known for trade and luxury. The cities of Pompeii and Herculaneum were near the mountain and had a fairly high standard of living. There was even a small resort town named Stabiae. The mountain was not seen as a problem as no major eruption had occurred in Roman history. Tremors had already been felt before that terrible day as excavations indicate they were repairing streets and underground plumbing. However they had no idea the tremors were connected with the nearby mountain. Pliny The Younger, staying west across the Bay of Naples, recorded what he saw in two letters he sent to Tacitus. Sadly his uncle, Pliny the Elder, would perish when he went over in his boats to Stabiae. 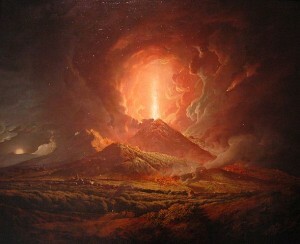 Pliny wrote the eruption lasted eighteen hours with Pompeii buried under 14-17 feet of ash and pumice. Herculaneum was buried under 60 feet of mud and volcanic material. Except for some who returned to reclaim what they had lost, the entire area was left buried and abandoned. Significant excavations beginning in 1927 on have revealed much of what life must have been like before the destruction. More somber were the finding of some 2,000 bodies. Volcanic ash hardened and preserved the outlines of their bodies. Once the flesh had gone, the outline remained but filled in with plaster revealed those final moments of their lives. And it was not pleasant at all. Bay of Naples today with Mt. Vesuvius in the background. The densely populated city of Naples lies nearby. Vesuvius is still an active volcano. Its last major eruption was in March 1944 and destroyed several small villages with lava. The eruption was seen from Naples and damaged (thanks to hot ash and other things)or destroyed up to 88 B-25 medium bombers based in Terzigno, Italy. The volcano is kept under constant watch to prevent anything on the scale of the eruption of 79 AD to the people who live under its shadow. 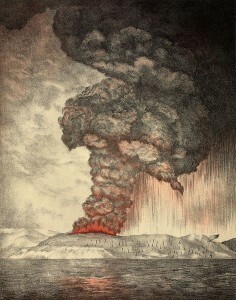 On 20 May 1883, Krakatau–a small volcanic island west of Sumatra in Indonesia–came alive with an eruption noticed by a passing German warship. Other eruptions would be noticed by commercial liners and those living on nearby islands for the next two months. Then on 26 Aug an enormous blast took place that destroyed nearly two-thirds of the island. Pyroclastic flows and huge tsunamis would sweep over nearby islands and coastlines. 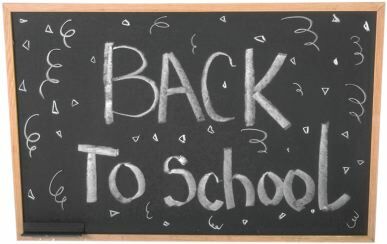 But the worst came the following morning, 27 Aug, at 05:30. Four eruptions would took place with the resulting sound heard over 3,000 miles away. Ash was propelled fifty miles into the air and would circulate around the globe creating colorful sunsets but also lowering temperatures worldwide by several degrees. 36,000 deaths resulted from the eruption and 31,000 were from the tsunamis created when much of the island fell into the water. The highest waves were 120 feet high when they washed over neighboring islands stripping them of people and vegetation. Pyroclastic flows that stretched as far as 40 miles claimed about 4,500. The Krakatau eruption of 1883 is considered one of the most violent volcanic activities in modern times and even recorded history. However volcanic activity continues in that area. In 1927, a submarine lava dome was detected in the area that had been destroyed by the eruption in 1883. A new island volcano began to emerge spewing ash. Other islands also started appearing as well but eroded away by the sea. Ultimately a fourth one appeared in August 1930 and was able to last. It was named Anak Krakatau and continues to grow taller each year. It is an active volcano and seemed similar to Stromboli in its eruptions. However more recent eruptions have resulted in volcanologists to warning people to keep a safe distance away. And more ominous is that a large lava dome is growing in its crater. Signs point to one day a very explosive event occurring at this volcano. 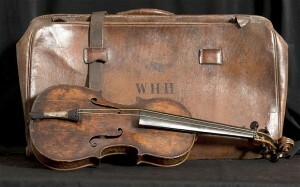 The Associated Press (AP) is reporting that the Hartley violin–owned by a private buyer who bought it auction in 2013–will be on display at two US museums in 2016. It will first go to Titanic Museum in Branson,Missouri from 7 Mar-29 May 2016 and then go to Titanic Museum in Pigeon Forge from 5 Jun-14 Aug 2016. The violin has not been on display since its purchase. Auctioneers Henry Aldridge & Son represent the owner. The Wayback Machine found this wonderful song by Boz Scaggs. We’re All Alone was released in 1976 on the album Silk Degrees. I remember this song and the album (back then it was on vinyl and got endless playing on my record player). The song reached #2 on the charts and other artists recorded their versions of it as well. A good song for a slow dance with your partner. Enjoy. No need for a full recap in this episode. Our brave cheftestants were divided into two teams–Team Hetal and Team Tommy–to cook a vegetarian dinner for fifty member of the vegetarian culinary community. It ought to have been a slam dunk for Hetal but it was not. Tommy had problems trying to be a leader since most of his team tried to work around him but in the end all worked together to win the round. That left Hetal, Derrick, Olivia and Claudia to face the dreaded pressure test. What does a cow, sheep, pig, and halibut all have in common? Answer: heads. The show sunk to a new level of surreal and disgust in one episode that most will want to forget. Poor Hetal. At least she was spared (or was it contrived that way?) the cows head. The sheep’s head is no picnic either. And being vegetarian she had to concoct a dish she could not taste to make sure it was seasoned properly. Oh boy. Olivia got the cows head, Derrick the halibut, and Claudia was pleased to get the pigs head. Coming from a culture that cooks and serves the whole pig, she is going to do it proud. And she does with a dish that got praised and saving her from elimination. That left Hetal, Derrick and Olivia to face the dreaded fall of the scythe. Hetal’s dish was not that good. Gordon did not call it dreadful but it was not that far off. Derrick had fusion confusion, which is to say he threw disparate elements together hoping it would impress. Olivia, next to Claudia, easily the best looking dish. And it was cooked well for the most part but Gordon found the sauce hid the flavor of the meat. If you cannot taste the meat, how do you know what it is? Could it be that famous meat-in-the-can that is beloved in Hawaii? I would have sent Hetal home. She failed in the team challenge and in the pressure test she produced a sub-standard dish. So she is saved because they like her, America likes her, and they want a vegetarian to continue on. Derrick and Olivia face the chop. Derrick is the hard driven rocker guy. He is determined and hard to put down. He showed cracks and produced a dish that in other circumstances he would not. Olivia’s only sin on the dish was that her sauce hid the beef flavor but that is enough. They have already decided it is her time to go. On her way out she proclaims Katrina the next masterchef. But it ought to have been Hetal walking out that door. If you cannot taste the food being cooked, you have a serious obstacle in getting into the top tier let alone the top two. At least the show did not have its version of the infamous Godfather horse scene*. But it sort of came close considering how nauseous Hetal got. *This scene like the movie is rated R.
My monthly cable bill arrived with a notice tucked inside it that said Rate Adjustment Notice. My local cable company–one of the few that is run by a municipality–is raising their rates. It is the first time in four years and the letter opens by reminding us they are an integral part of our city. Meanwhile as satellite dishes pop up all over the city and Internet streaming brings more content then before, the rates will be going up seven percent come September. Thus if you get what is called the Expanded Basic (channels 2-99 with cable news and sports) the cost will go up to $66.89. As is usual when you get these notices, they point out their rates are not out of line but that due to rising costs they have to make an adjustment. Here is how to read such notices: High price cable channels like ESPN get high fees per subscriber so we have to pass those costs to you. You are subsidizing channels that make little profit from advertising (think MSNBC)but rake in those per subscriber fees to keep them afloat. As more evidence that people are moving away from cable company offerings, getting this kind of jolt in the mail will probably convince many to reduce their cable subscription and get most of their news and entertainment online. I did that a long time ago when I reduced my cable subscription to limited basic (local broadcast channels). I have an indoor antenna that allows me to see all the local channels in hd (and a lot of those sub channels not in the cable subscription). Alas my apartment will not allow a antenna on the roof (and satellite while cheaper than cable has contracts you have to sign)so limited basic is a back up when things go haywire. Fortunately the rate increase does not hit the limited subscription. Why? Simple since just about all the local channels do not charge a retransmit fee for cable use. In order to be seen on cable, broadcast channels have to periodically consent to it. And they usually grant it because it works out well for them. Sadly though some channel owners are starting to demand fees from cable companies to retransmit. One channel in my area did just that and was dropped for a few years. They dropped the fee and now are back on. The squeeze to force high rates on cable only channels and then to demand fees for carrying broadcast channels means consumers are being hit both ways. They are being forced to subsidize cable channels they do not watch. And to watch local broadcast channels with national programming means fees as well. So cable bills start going up to reflect this reality. And will get worse as more people cut back on cable. Cable is getting desperate in trying to stop this bleeding by offering their own Internet streaming options. The cable bundle death watch has begun. DSL Reports reported on its blog the following: “Cord cutting is accelerating with the pay TV industry losing 566,000 subscribers last quarter alone. With DirecTV alone losing 133,000 subscribers last quarter, MoffettNathanson notes it was the worst second quarter net loss in history for the nation’s legacy TV industry. The 566,000 subscriber loss comes on the heels of a 321,000 subscriber net loss the quarter before.” And it is predicted to get much worse as the number of pay-tv households is shrinking. Consumers no longer see the value in cable television they once did. Some have called the concept of bundled cable television a great swindle because cable subscribers are forced to subsidize a whole lot of channels they do not watch or do not want to watch. It is great for the cable channel owners because they have a guaranteed revenue stream from cable subscribers. Not any more. Which is why Netflix and Amazon (along with others) are getting more customers. When ESPN, one of the priciest channels on cable per subscriber, starts feeling people no longer watching you know they are getting worried in the corporate suites. 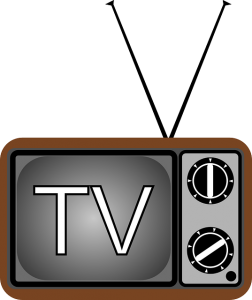 They can try to compete for viewers the old fashioned way by earning them but cable tv is not used to that. Broadcast tv has to do that which is why its numbers are higher than cable channels. If Lifetime, Food or SyFy actually have to compete on the open market for viewers, will they be able to do so? We may find that out in a few years. A dish covered with an alcoholic spirit and set alight before serving. *The Mystery Box contained just alcohol and matches! All the cheftestants had to do was prepare a meal that was flambéed for the judges to eat. They demonstrated the technique but sadly no one go to taste them! *Safety experts recommend you never pour directly from the bottle when you are igniting the alcohol. Otherwise the flames might follow the alcohol back to its source and that will lead to serious injury or worse. *The top three were Tommy, Hetal, and Stephen. All three produced Masterchef worthy dishes making it a tough call but Stephen got the win. Back in the pantry he decides between three Southern favorites the judges like. He goes with Graham’s Waffles and Fried Chicken. Excellent! Now that is a tough one. Easy if you have a professional kitchen to assist but if you are doing it yourself, that means a lot of work. You have chicken to fry and waffles to make. And both plus whatever sides have to be on the plate and done for the judges to taste. No room for error here. *Stephen not only gets a place in the top eight, but also can decide who has only thirty minutes to do the dish. That could be a death gong and he chooses Derrick. So Derrick has to wait until only thirty minutes are left to start cooking. Yikes. And Stephen conducts his own version of psy-ops as he starts badgering him as he cooks. *Christina points out using non-stick spray is a mistake to use on waffle irons. The reason is that it does not help your waffles cook faster or better or even easier to remove. Better to apply vegetable oil with a baster brush or paper towel. Also if you use such sprays on nonstick surfaces like most waffle irons, it leaves a residue that makes it harder to for the coating to work properly. It wears them our faster as well. 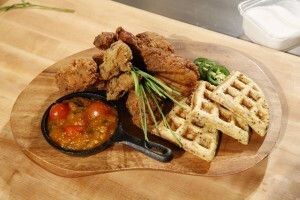 Tommy’s duck fat fried chicken with pecan-quinoa-corn waffles. *Both Tommy and Hetal excelled with their dishes and won elimination round becoming team captains in the next episode. Sadly two unexpected people ended up on the bottom. While there were some boring dishes, Claudia and Shelly ended up on the bottom. Claudia was a surprise since she has shown steady and consistent good skills for the most part. Her dish was panned as looking as it came out of a diner. And her chicken was underdone. Shelly was bad too with bland waffles and dry chicken. Shelly got the chop and bade farewell to the kitchen. I hope she continues her dream because she has the ability to be really good. *Christina: Hey most people know you use alcoholic spirits for a flambé. *Fashion Tommy showed skills in both Mystery Box and Elimination. Unless he does a major stumble, I predict he is in the top four. *Hetal also once again showed she might be in the top four. Her chicken and waffles with an Indian twist showed her creativity. *Stephen really is quite the character. And Derrick showed how tough he is as well. *It sometimes happens that the pressure just crushes you and I suspect that is what happened to Claudia. It got to her and her dish sucked. Lucky for her Shelly did worse. She will have to step up her game if she wants to stay longer in the competition. Next week: Team competition will demonstrate Tommy’s leadership skills and the elimination challenge has animal heads on the menu. The Wayback Machine found this Journey classic from 1978 written by Steve Perry and Neal Schon. Funny thing about this song is that Steve Perry originally wrote the song about Los Angeles. But when he joined Journey he decided San Francisco was a better match. It was released as a single in 1978 and was only modestly successful reaching 68 on the Billboard Hot 100. It became more popular later and one of their most popular songs. You will often hear it at San Francisco Giants games and Steve Perry has actually performed it live on occasion (game 2, 2010 World Series in San Francisco for one).